Aluta is built like a truck with a face to match. Large and muscular, she is often mistaken for a male on first glance and isn't very feminine. She carries herself like the alpha she once was, though she's always careful to show deference when Alignak is about. She has blue-grey fur with large swathes of silver slashing her sides. Light fur covers her muzzle and the very tips of her extremities. She has many scars and nicks, but most are faded or aren't visible. Physical Strengths: Sturdy and muscular (especially for a female), she has one of the strongest bites in the pack. Her size affords her some reach over her female comrades. Physical Weaknesses: Not exceptionally fast and tires easily after short sprints. She is both physically and metaphorically inflexible. She adheres to her tactics as rigidly as she sticks to her principles, preventing her from adapting to change on the fly and blinding her to underhanded opportunities in a fight. Aluta is a consummate soldier, uncompromising in her beliefs and a steadfast ally. Authoritarian by nature, the Organization's strict codes of conduct fit her like a glove and she strives to embody the very image of the pack. She may not be the sharpest tack in the box, though, but she's certainly the most rigid. While generally benign and well-meaning, Aluta isn't above throwing her weight around to get her way. She abhors insubordination and is quick to re-establish her dominance over the lower-ranking wolves in the pack, earning her a vicious reputation. While no one would question her bravery and skill, they are wary of her and would rather avoid spending any time with her socially. Thusly, Aluta spends much of her time shadowing the Alpha, Alignak, as he patrols the grounds. And although Aluta is happy in her role of lieutenant, she still harbours ambitions beyond her station and nurses the hope of having pups of her own again. Her strong maternal instinct manifests itself in her interest in the pack's pups and yearlings. She trains them as she would her own blood. She's a deeply devoted, if a demanding mother and pushes her charges, expecting nothing short of excellence. Likes: Sunny days, funny jokes, eating, hunting and the sound of gurgling streams. Dislikes: Winter (all of it), bad puns, eating snails, thunderstorms. 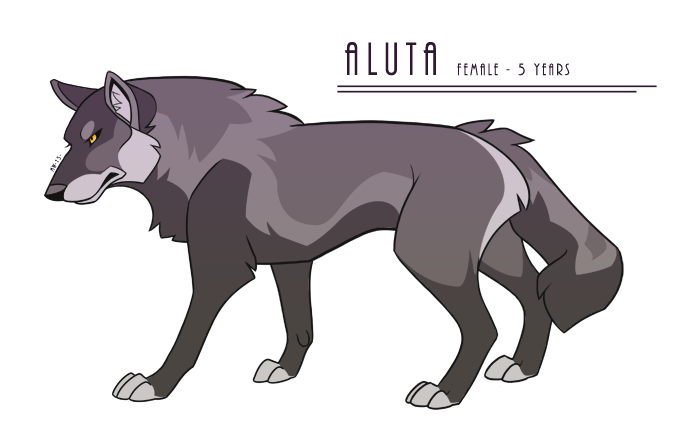 Aluta is the deposed alpha of a small pack that occupied a small territory north of the Backwood Wilds. Like thousands before her, she left her home pack to wander the countryside as a dispersal youth. She managed to find a mate in relatively short order, a dependable fellow by the name of Aegor, and soon she birthed three young pups. The young family had always had difficulty eking a living from the sparse surroundings. Three other well-established wolf packs surrounded their small territory, effectively surrounding Aluta's family and claiming the best hunting grounds. It was not the best choice of den site, but such are the mistakes of youth. Alas, Aluta would learn from this the hard way. One of the neighbouring packs, eager to expand their territory, stormed the den while she was away hunting. Her mate fought valiantly, but even the largest males fall when faced with greater numbers. Aluta was forced to turn tail and run South to escape. Eventually she came upon the Backwood territories and ran afoul of the Organization pack when she poached a few hares on their land, managing to escape by the skin of her teeth every time. Soon, however, they cornered her. Tired, hungry and heartbroken, Aluta's rage boiled over and, instead of running off, she chose to stand up against the Organization warriors. Impressed by her size, ferocity and stoicism in the face of adversity, she was offered amnesty if she would join their ranks. Her strength and attitude quickly landed her a high rank and her unwavering loyalty to the Organization has earned her respect from her packmates. She acts as Alignak's deputy and enforcer, keeping wolves in line and she takes an active role in training the clan's pups. looks good! except the rank I put on the pack thread: http://thebackwoodwilds.forumotion.com/t13-the-packs for second-in-charge was Assistant to the Top Dog, so could you change her rank to that, please?